The Sacramento area really never experiences winter. A couple of months a year we get some rain, fog and general unpleasantness but we only average one day a year below freezing. If we ever got anything more severe than that, the whole city would grind to a halt. While we’d been easing into Fall gradually, there was a definite chill in the air this morning. I even briefly considered putting up the top on my car during my commute this morning. I took this simple image along the Merced River, in Yosemite, last month. During a midday workshop break I had to make a run up to Crane Flat to fill up my gas tank. (If you’ve ever had to purchase gas in El Portal then you know why I drove to Crane Flat.) On the way back to the hotel I stopped along the river where I found these leaves. Back-lit and slightly underexposed, they made a nice little scene. 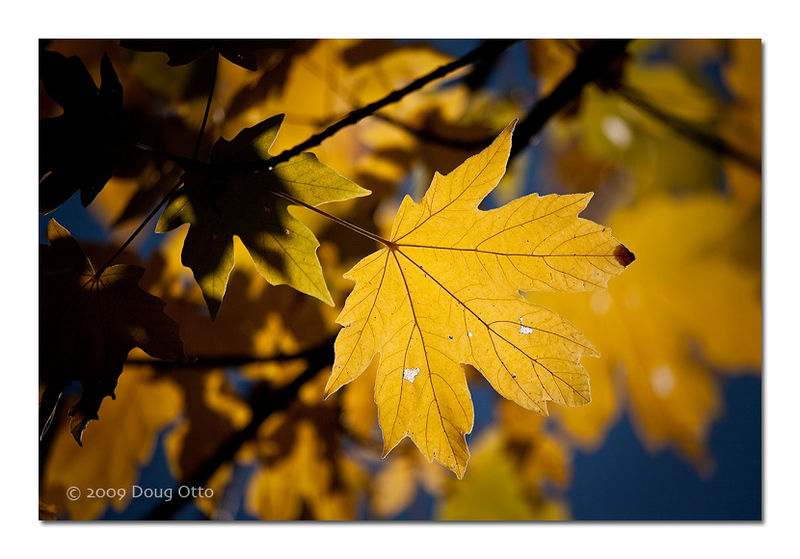 This entry was posted in Random Thoughts and tagged backlight, California, crane flat, doug otto, el portal, Fall, leaves, maple leaf, yosemite national park. Bookmark the permalink.